Salesforce.com has long had a public AppExchange software marketplace, but now it’s going to give customers the ability to create their own private AppExchanges where employees can download applications to use in their jobs. Private AppExchange is generally available as of Friday to customers running Salesforce.com’s Enterprise and higher editions, said Sara Varni, senior director of AppExchange marketing. However, those customers can give employees who don’t use Salesforce.com itself access to the private store for $5 per user per month. Salesforce.com is giving customers the ability to create private app stores. Enterprise application stores are rapidly coming into favor as companies seek to appease workers who are used to the generally painless experience of consumer app stores like Apple’s iTunes. The managed app store model also gives enterprises a way to place a layer of governance over the software and devices employees are using, even as they provide easier access to software. “The whole goal of private AppExchange is to empower the CIO to say yes,” Varni said. While IT departments curate and oversee which applications get into the store, based on pre-determined permissions, employees can download them when they wish, she added. In February, Gartner released a report predicting that 25 percent of enterprises will have their own app stores by 2017. Salesforce.com is clearly hoping to keep its current customers from using rival vendors’ technology, such as BMC’s recently launched AppZone, to build out these stores. Customers can use Private AppExchange to deliver any Web, mobile or desktop application to any device, with centralized authentication through Salesforce.com’s recently launched Identity service. Stores can also be customized to reflect a company’s brand or various departments’ needs, according to Salesforce.com. Salesforce.com didn’t run a formal beta program for Private AppExchange, but sought input from about 50 customers into its design. “Given our conversations, we know customers are hungry for this,” Varni said. The development effort was made easier given that much of the plumbing was already there, given the public AppExchange, said Ryan Ellis, senior director of product management. Private AppExchange doesn’t solve every problem related to enterprise app stores, such as the potential complexity of tracking software licenses and subscriptions as users download and use various applications. It’s possible to integrate Private AppExchange stores with third-party license management systems, Varni said. 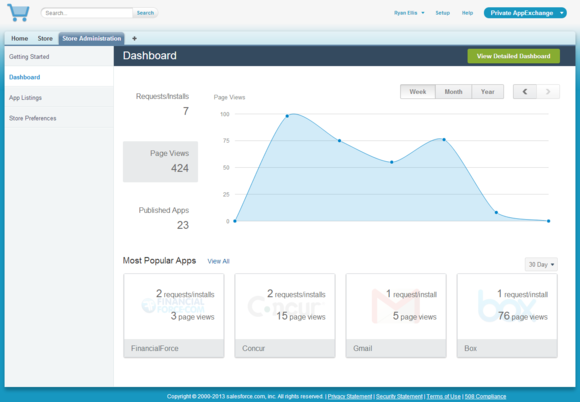 Salesforce.com has also integrated Private AppExchange with its Chatter collaboration software. This means that “organizations can enable their employees to discover, discuss, rate and self-support applications collaboratively versus just being pointed to a generic app store and left to fend for themselves,” Constellation Research vice president and principal analyst Alan Lepofsky [cq] said.